This is an unusual and interesting book that may attract children who are not normally into reading. A frog finds a book of spells, torn into pieces. First he imagines it is about boats, and then about castles (an excuse for some beautiful illustrations made of cut-out pieces of spell-book) and that he can kiss a beautiful princess. Eventually he decides to try to find a spell to turn himself into a handsome prince. At this point the pages in the book split into horizontal halves such that they can be mix and matched in different ways. On the left is the pieced-together spell, and on the right are the top and bottom halves of particular animals, together with part of their names. Some bizarre and entertaining creatures can be made, such as the Fabbit, the Snewt, the Brog, the Rake… and eventually the various combinations that lead to the Prince. The pages can be turned and combined in any order, so young children could have some autonomy here which may well suit those who usually dislike being read to. The large letters and the portmanteau creature names are an excellent way of breaking down language as an introduction for reading – although it is annoying that they are all in capitals which makes it much harder for children to read themselves. The Prince is comically bare-bottomed, and although he does find his princess there is a little twist in the tale at the end. 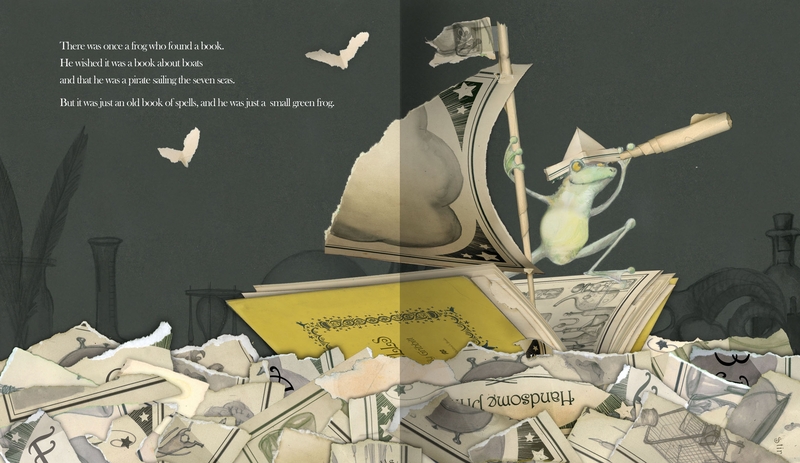 As usual Emily Gravett’s illustrations are delicate, stylish and beautiful, and although this story lacks a strong narrative and as a result any sense of real purpose, it is nonetheless fun to read and experience and is an excellent book for discussing and interacting over. A quirky little treat.